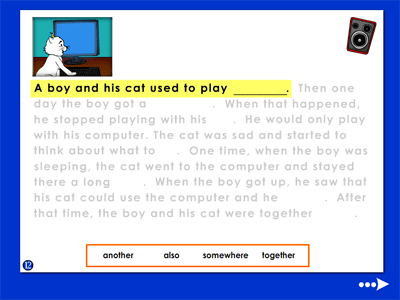 Here is an example of teaching the word "computer" through the Savvy Sounds format which develops the critical skill of sound blending. In "sounding out," it is not enough to put a sound on each letter. To arrive at words, the individual sounds have to be blended together -- a difficult process for many children. Savvy Sounds eases these hurdles by having the program contribute to the blending process. 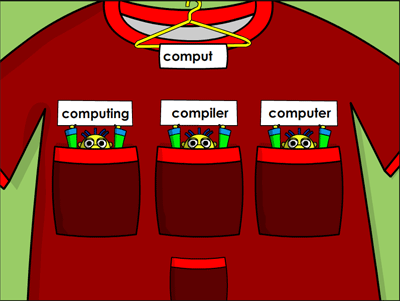 For example, for a word like computer, the program will show and say the first part of the word (e.g. "comput"). Then the screen shows a set of words and while the audio says the target word (e.g. "computer") the child has to select it. 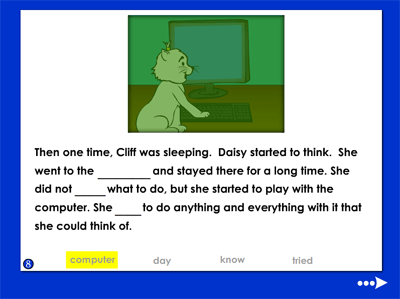 Since the beginning blends are already in place, the child has to deal only with the final sound in selecting the word. This greatly eases the blending process. 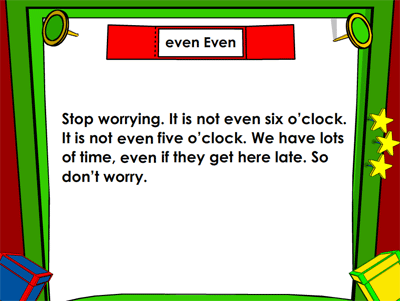 Here is an example of teaching the super sight word "even" through the Detect and Select format. 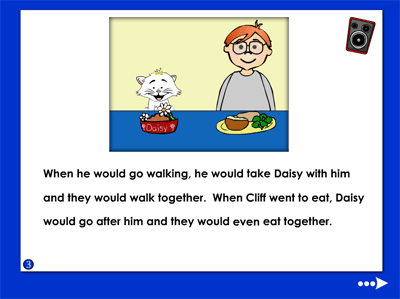 (Super sight words are a group of about 100 words - all of which are taught in ASD Reading - which occupy 50%-60% of every page of text in the English language.) Successful reading requires a steady scanning of words from left-to-right. For example, the same words (can fly they) convey very different messages depending on their order (e.g., they can fly vs. can they fly). To help children achieve smooth scanning, the Detect 'n Select format shows lines of text. After learning all the words in a book, children are given the book to read and/or have read to them by the program. Level 5 has 6 books. Here is a sample page from Book 28.